(Left to right) Joselyn Cadena, 13, and Itzel Alvarez, 16, are just two students among 18 to represent Merit School of Music at the 16th Suzuki Method World Convention. Alvarez, who plays the violin, is part of Merit School of Music’s Suzuki-Alegre Strings Ensemble, a program that serves as the national model to the traditional approach of Suzuki training with its incorporation of Latin folk songs. High attendance and participation are expected from students, who must make a two-year commitment to the program. 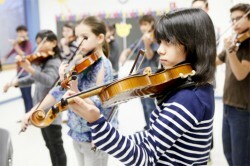 Currently, more than 200 students across the city are enrolled in the Suzuki-Alegre Strings, but only 18 violin and cello players, ranging in ages 10 to 18, most of whom are Latino living in Pilsen, Little Village, and Lawndale areas, will join 2,100 young musicians from all over the globe in the birthplace of the Suzuki method. At the Suzuki Method World Convention, musicians will demonstrate their talent, perform for their peers, and participate in lectures, lessons, and master classes taught by leading Suzuki instructors. “This is truly a trip of a lifetime,” said Alvarez, who has been with the Merit School of Music since the age of 13. “The months of practicing really paid off.” Founded in 1979, the Merit School of Music is a non-profit organization devoted to providing children, regardless of economic standing, access to “high quality music education,” to more than 6,000 Chicago-area students. Forty-four percent of Merit’s student body is of Hispanic origin and eighty-five percent of students receive scholarships and financial aid. Merit’s Suzuki-Alegre Strings Ensemble co-directors Monica Lugo and Herine Coetzee Koschak will be traveling with the students. For more information about the Merit School of Music, visit www.meritmusic.org. Or call 312-786-9428.